Destination Moon (1953) gives a detailed account on the preparation and the launching of the expedition to the Moon for which Professor Calculus has chosen Syladavian soil. The red-and-white chequered pattern on Hergé's rocket was based on a technique used to measure movements in a rocket during launching, developed by NASA. The pattern made it easier to observe rolling and spinning in a rocket at take-off. Barely have they returned from their adventures in the Middle East (Land of Black Gold) when Tintin, Captain Haddock and Snowy receive an invitation to Klo, the capital city of Syldavia. Professor Calculus is in the country working on a top-secret project in a state-of-the-art secure government facility: the Sprodj Atomic Research Centre. The subsoil of the remote region in which the Sprodj Centre is located is rich in the radioactive element Uranium. The Syldavian government and Professor Calculus' scientists hope to harness atomic energy as a way of propelling mankind into a new era of space exploration, yet behind the scenes there is a sinister plot by aggressive foreign powers to hijack this technology for nefarious ends. In the end, whatever the stakes, Professor Calculus is determined to achieve his goal: to build a rocket that will transport human beings to the Moon. But who will he take with him on this historic journey? Tintin, Captain Haddock and Snowy of course! 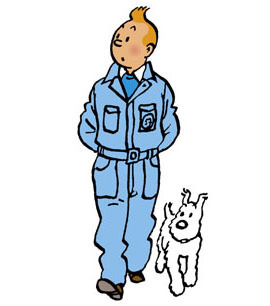 Bernard Heuvelmans, one of the scientists who gave Hergé expert advice, explains that the origins of the project to send Tintin to the Moon stretch back as far as 1946. When he finally decided to create the Moon adventure, the author quickly began to carry out research, consulting Bernard Heuvelmans' book L'Homme parmi les Étoiles (Man among the stars). Information from another book, L'Astronautique (1950) by French Professor Alexandre Ananoff, helped Hergé to create his Moon rocket. Heuvelmans himself proposed the outline of a story, which he co-authored with the first editor of Tintin magazine (launched 26 September 1946), Jacques van Melkebeke. In the end only one page of drawings was actually created for the Heuvelmans/van Melkebeke project. The story would begin in the United States. After some consideration, Hergé shelved this particular storyline. He did, however, retain a few ideas that he introduced into the revised storyline that became the Tintin Moon adventure we know today. The new Moon adventure was launched in Tintin magazine on 30 March 1950. ! Tintin magazine began the publication of Explorers on the Moon on 30 March 1950. The story spanned 134 pages in the magazine, but would be split into two 62-page volumes when published in book format: Destination Moon (1953) and Explorers on the Moon (1954). The magazine format was very different from the book format and readers of Tintin never saw the title Destination Moon in their magazine. They did, however, read pages and strips that Hergé would later cut from the story, when fitting it into the 62-page book format. As had been the case for Prisoners of the Sun, for the magazine the plan was to format the Moon adventure for publication on the two top thirds of a double-page. The bottom third of the space would contain explanatory texts with information about the conquest of space. In the end this format was not used and readers of Tintin magazine read the story in the same classic format we know today. The two front covers of Tintin magazine (currently on display at the Hergé Museum) that announced the arrival of the new adventure, were disconnected from the actual content of the story. The illustrations portray fantasy scenes that have nothing to do with the final version of Explorers on the Moon. One of the drawings evokes Georges Méliès' film A Trip to the Moon (1903), considered to be one of the first films to experiment with special effects. As for the Moon itself, it is depicted with a face; the expression suggests that, "Madame la Lune" is in a bad mood. It was common in literature (Jules Verne, etc.) and in films (Méliès, Fritz Lang, etc.) for spaceships to be depicted as bomb or cigar-shaped. Hergé wanted to make sure that his rocket was at the cutting-edge of technology, and it was only natural that he was inspired by the drawings and plans of the biggest expert on rockets, the German scientist Wernher von Braun, who had designed the infamous V2 flying bombs used in World War II. Professor Calculus' X-FLR6 prototype rocket is also based on a missile designed by the German scientist. he red-and-white chequered pattern on Hergé's rocket was based on a technique used to measure movements in a rocket during launching, developed by NASA. The pattern made it easier to observe rolling and spinning in a rocket at take-off. Eagle-eyed readers and collectors will note that the shade of red used to colour the Moon rocket changed as new editions of the story were published. The chequers on the rocket were almost orange to begin with, and became a more flamboyant red as time went on. Explorers on the Moon was the first story to be produced entirely by Studios Hergé, a company founded on 6 April 1950. But Hergé had already employed assistants, notably to help with the colouring of his earlier black-and-white stories. Edgar-Pierre Jacobs assisted with the décor for certain Tintin adventures (King Ottokar's Sceptre, The Seven Crystal Balls, Prisoners of the Sun), preliminary drawings for which are today on display at the Hergé Museum in Louvain-la-Neuve. One of the first employees was Bob De Moor (1925-1992), whose first contribution would be to create a full-page illustration of the Moon rocket. It took Bob De Moor a whole month to finalise the intricate details and perspective in the majestic drawing of the rocket! Even before this period, in the 1930s Hergé set up a small company, the Atelier Hergé, for advertising and graphic design commissions. Hergé's research and attention to hyper-realistic detail went into overdrive when it came to the Moon adventure. There was absolutely no space in any drawing for fantasy or over-imagination. The Sprodj Atomic Research Centre was based on the Oak Ridge Centre in Tennessee. high altitude. The cover of Destination Moon takes the reader to the heart of the adventure, riding behind a blue 1946 CJ 2a jeep! An enraged Professor Calculus gives Captain Haddock an unscheduled tour of the premises. Hergé managed to infuse informative and scientific information into his story while using Captain Haddock to provide a comic counterbalance. This ensures that the narrative never becomes boring or long-winded. But although it looks exciting perhaps it would be best not to climb on board the jeep: it is missing a steering wheel! The steering wheel should be in Calculus' hands, visible between the Professor and Captain Haddock's spacesuit. Was this a mistake? Was Hergé distracted? In any case nobody apparently noticed the detail... apart from avid readers many years later! This is one of my favourite Tintin books of all time! A good story structure, though the excessive use of slapstick is tiring. Far too many flailing arm gags, door bumping and pipe-breaking for such a serious plot. Herge also let himself down with the bear invasion scene. Bears are highly solitary, 'father bears' play no role in parenting and the most cubs a mother will have is two. Why a swarm of ten cubs? Poorly researched and unnecessary. Interestingly, the Croatian edition translates the expression "faire le zouave" (eng. "acting the goat") with the metaphor of acting like a toucan, which is strange because Croatians use the metaphor of donkey a lot for those kinds of things. Definitely one of the best!